Brix is a method used to measure sugar, mineral, vitamin and amino acid content in produce. Produce grown in compost /mineral treated soil has consistently higher brix readings. Nutrient content in produce can also encourage drought and insect resistance and longer shelf life. 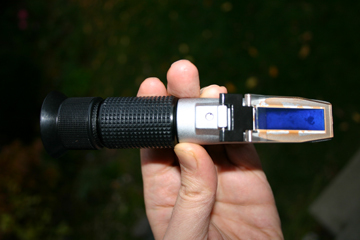 A brix meter shown above is a refractometer that measures the natural sugar content in fruits and vegetables. A small amount or juice is squeezed from the produce placed on the transparent window and expose to light. A reading on the meter appears as in the image below. Maraschino cherries rated 19 on the brix meter. Pathogenic bacteria, such as Staphylococcus, Streptococcus, Influenza, Pneumococcus etc., can thrive in anaerobic environments. Aerobic Composting of manure with our equipment and minerals locks in ammonia and converts the environmental conditions to aerobic. Compost and minerals appear to increase the brix readings of fruits and vegetables. Soils treated with our products have healthy microbial activity and tend to freeze slower and thaw quicker providing the opportunity for earlier planting and extended harvesting.